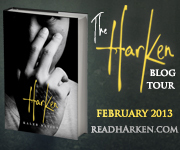 Harken Blog Tour: Review, Q&A and Giveaway! After surviving an assassination attempt, teenager Michael Asher discovers that he is at the center of a worldwide conspiracy reaching higher than any earthly power. A supernatural organization desperately wants him dead. He doesn’t know why. Everyone who might have the answers has already been killed. Tumbling into a web of international secrets, Michael is forced to fight back and dig up the truth. He begins to question how much of the world is truly as people are led to believe it is. Are there things that humanity is not being told? Who is the puppet master? And how far into the maze can he venture before he is lost forever? Michael is the “Eye Guy.” He can read people by their eyes. Michael is a loner at school except for one best friend, Spud. Spud is a master at hacking computers. Everyone else pretty much stays away from him because of his special ability. He has made a business for himself, hiring out his services to find out if his clients have cheating spouses, bad business partners, etc. Michael sneaks out one night to meet a client, Mr. Sharpe. However, this meeting turns into a nightmare when Mr. Sharpe attacks Michael and tries to kill him. Michael barely escapes with his life, his car totaled, and no one believes that someone tried to murder him. The police think he’s just making up an excuse for wrecking his car. His mother thinks he hit his head in the accident and confused. This makes Michael doubt himself for a few moments, until he realizes that Mr. Sharpe’s car would still be where the met, since he saw Mr. Sharpe dead underneath the car. After I have set up the beginning of the story, this is where I end it. There’s just too much action without giving up any spoilers for me to write! Harken…supernatural…conspiracy theories…who would have thought the two combined would make an amazing story. When I start reading a story, I have scenarios going thru my head on what direction the plot might take. With Harken, I had no clue what that direction was. Michael proves to be a resourceful and strong character. He has learned to put his ability to his advantage. Callista and Thad are with Michael through the whole adventure. Their bond goes deeper than just mere friendship. The villains are ruthless, dangerous and completely heartless. Harken pulls on your emotions…sadness, humor, anger, anxiety, suspicion, fear..There is so much going on your brain synopsis is in overdrive. There’s a hint of romance, which is just perfect because that doesn’t take away from the true plot, the supernatural conspiracy. Harken is brilliant in the total uniqueness of it’s originality. The end, of course, is a killer cliffhanger. I wasn’t ready for it to end. There’s so much left unexplained, I look forward to have those questions answered. Stacey was lucky enough to interview Kaleb!! She came up with some GREAT questions! brief introduction to Michael Asher? services. His work is his life. Being unusual is his identity. fan moments during the build up to the release and announcement? about 10,000 hits in a single day. worked in marketing for many years. of things that are coming. may not be familiar with your youtube history. being forced to eat at home. Terrible, I know. deal, and made most of my friends through our work on that website. I should go hide those right now). There are some great things going on for this Tour. At each stop, you have a chance to win a Harken Prize Pack!! This Giveaway is International! Check out the GRAND PRIZE!!! KALEB NATION is an author and online personality. His blogs and videos have received over 50 million hits online, and he has been featured on NPR, Entertainment Weekly, The Huffington Post, and more. 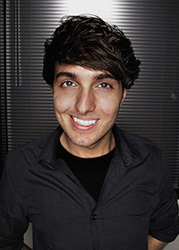 While writing Harken, Kaleb documented his progress through video blogs at Youtube.com/KalebNation. A black belt in taekwondo, Kaleb lives in California with his chinchilla, Chilla. 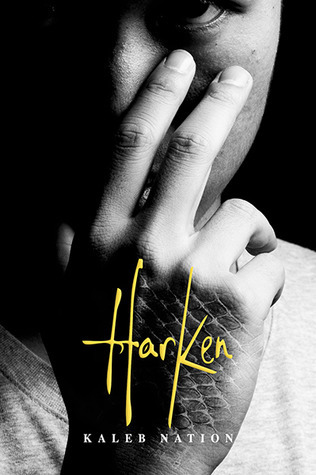 Harken is his first novel for teens. Kaleb regularly posts on Twitter (@KalebNation) and blogs at KalebNation.com. HARKEN is currently on Kindle but will be available on other devices soon. Those questions were great! I'm loving this blog tour so much! And these giveaways are killing me! Everything is so amazing! I love this tour! The giveaways are totally awesome! Go Kaleb! 😀 He's one of my inspirations! I'm so happy for Kaleb! I know he'll make it far as an author. Kaleb Nation is my favorite author. Its so cool to be able to watch him go through this and feel like a part of the experience. I wish I could write like he does. I love this tour so far, I have been to every stop! I love the meaning behind the title "Harken", I didn't know that before 🙂 I love this tour!! I'm loving this tour! Yay for giveaways!! I'm enjoying the tour. I would never have heard of this book otherwise. I'm loving the tour so far! I didn't know Kaleb designed the cover himself…he never stops surprising me with his many talents. Great interview and I really love the tour so far, thank you for the giveaway! I love this tour! I can learn so much about the book & I don't have to go anywhere! Totally loving this!!! Awesome prizes to go with an awesome book!!! What could be better? I love how each blog has different information regarding the book! I've learned some neat stuff! This is completely awesome! 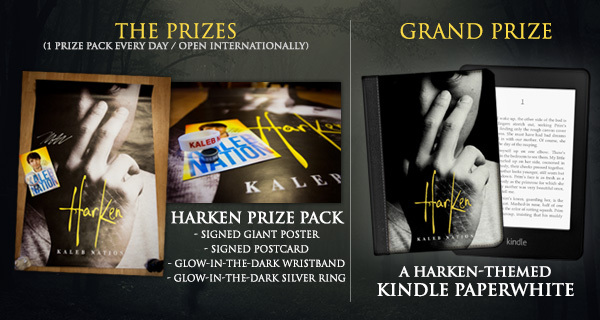 Kaleb is amazing, and Harken is an incredible book! I can't wait for the other books, and this book tour has been great!